Those who prefer places with a little heritage rather than modernity and might be visiting the Wimbledon Tennis Championships (or croquet, for that matter) could do a great deal worse than The Rose and Crown. Known to have been operating as an inn during the second half of the 17th century (when it was referred to as The Sign of the Rose), this classic London brick building later became a meeting place for literary types including Algernon Swinburne and Leigh Hunt. Indeed, the latter once wrote of the place to a friend: “When I find myself in the little room with the window open and the garden before us and a glass of claret on the table, care seems to be excluded”. The pub that its former literary patrons would have known is somewhat larger today than it was in the latter half of the 19th century (the building was extended in 2002 to create a number of guest rooms) but they would almost certainly still recognise the place. 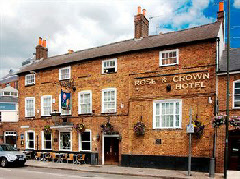 The Rose and Crown offers 13 en suite rooms in all (of which 8 are double, 4 twin) with complimentary Wi-Fi and satellite television. Effectively a village pub (and Wimbledon is, of course, a London village), it offers traditional food and drink and an outdoor seating area. Reviews and Booking. Please note that nightsinthepast.com plays no part in the actual review, booking or reservation process for The Rose and Crown or any other accommodation. Costs for maintaining and developing Nights in the Past are met solely by it being the last referring site to our partners which results in a completed reservation.